While reading about train history in our area, we discovered some interesting information about what was listed as "the shortest tunnel in the world". That got our attention! Especially when we realized it would make a wonderful day trip from Ashe County where we live. The tunnel is located on Hwy 133 about 5 miles outside of Damascus VA. 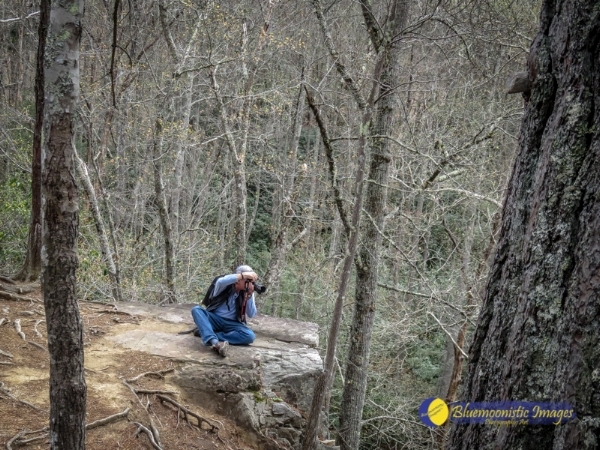 This unusual rock formation is a ridge of the Holston Mountain in the Cherokee National Forest and stands seventy-five feet high but only 20 foot wide. As we know from Virginia Creeper history, logging was at its peak in the early 1900s. The Backbone Rock stood in the way of a train route between Damascus and Shady Valley, Tennessee. A tunnel was drilled through the rock in 1901 by the Beaver Creek Railroad. Here's where the story gets interesting. A big OOPS occurred when the engineers realized they forgot to allow space for the train's smokestack to clear. One can only imagine how this really played out, but the result was that an area for the smokestack had to be hand chiseled into the rock which certainly adds to the character of this tunnel. What's not to love about a tunnel that actually looks like a smokestack went through it! The Beaver Dam Railroad in its prime hauled as many as 100,000 sawed boards daily for the Tennessee Lumber & Manufacturing Company. But as we all know these ventures were always short lived and when the timber played out the line was abandoned in 1918. This is a story we have heard over and over again. With no care to what they did to the beautiful Appalachian mountains, the big companies stripped the land of all the trees and then left without ever replanting a single one! Many rail lines were built through the mountains and then abandoned, leaving communities to deal with what was left behind. After these rails were removed the U.S. Forest Service used it as a truck service road. In the 1930s the CCC (Civilian Conservation Corps) came to the rescue! 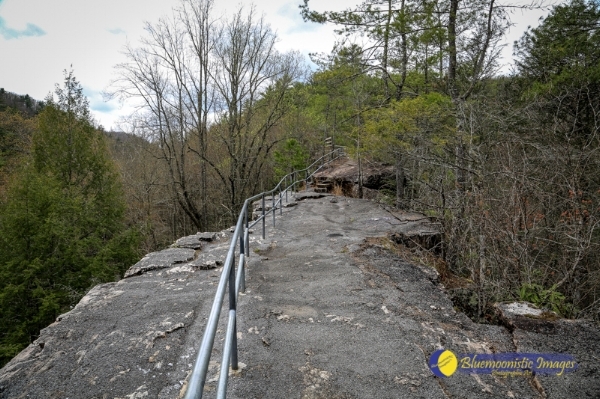 The tunnel was widened to accommodate a two lane road, hiking trails were established and stone steps to the top were built up and across the tunnel. It created a beautiful recreational area with a picnic shelter and tables along Beaver Dam Creek. Today it is complete with an overnight campground that was added in the 1960s. We can attest to the fact that the site is well used. While we were there we climbed to the top of the tunnel on the stone steps which is a bit of a challenge going 75 ft straight up but well worth it. We met all ages making this trek but as the sign says "watch your children" as there are not many guard rails. We took a picture of a couple at the top that grew up in Abingdon and said as children they use to just fly across the top. Scary thought but we also saw kids being dare devils. There were families using the grills and having picnics, kids wading in the water, a couple with hammocks strung up and fly fishermen too. For us it was a perfect way to spend Earth Day and it appeared many others felt the same! We truly recommend this magical spot for anyone who wants to take a Day Trip from our area or anyone who wants to spend a few days camping in our beautiful mountains. What a joy it was to find another backroads adventure for the Bluemoonistic Team while reading about Appalachian railroad history.